•Offset cable ties route and position bundles away from a mounting hole to protect them from rubbing, heat or obstructions. •All-in-one bundling and fastening solution reduces costs and assembly time. •Anti-rotational oval fastener forces bundle to travel in intended direction. •Offset cable ties route and position bundles away from a mounting hole to protect them from rubbing, heat or obstructions. 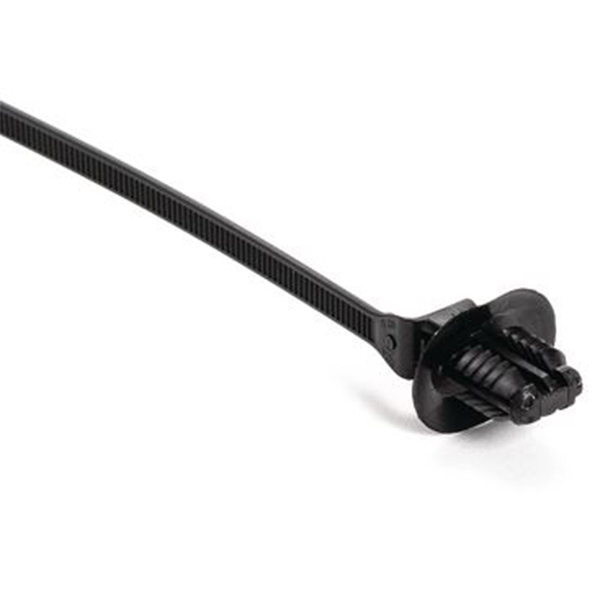 One-piece offset cable tie and mount offers a simple bundling and mounting solution. The innovative design of this fir tree establishes a 360-degree interface with the panel hole, ensuring a more secure fit. The oval shape won’t rotate once inserted, ensuring proper routing of wires and hoses. Offset feature positions bundles away from a mounting hole. The disc feature prevents rattling in high-vibration applications and protects against debris ingress.